Lunar New Year greetz from the team! All the best for the Pig Year! Click on flyer to enlarge, save as and print. Each flyer permits TWO before 11pm. Entry strictly by flyer invites or priority guestlist only! FREE ENTRY WITH PRINTED FLYER FOR TWO before 11pm. 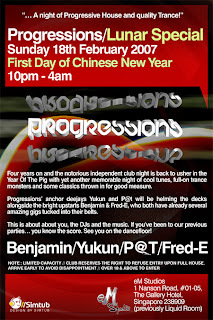 DJs BENJAMIN, YUKUN, P@T and FRED-E.
Four years on and the notorious independent club night is back to usher in the Year Of The Pig with yet another memorable night of cool tunes, full-on trance monsters and some classics thrown in for good measure. Progressions’ anchor deejays Yukun and P@t will be helming the decks alongside the bright upstarts Benjamin and Fred-E, who both have already several amazing gigs tucked into their belt. This is about about you, the DJs and the music. If you’ve been to our previous parties… you know the score. See you on the dancefloor! Finalized details to follow soon... please check back! Email Progressions Asia to get on our mailing list, if you're not on it yet. An emailer will be going out soon for the event guestlist (limited).